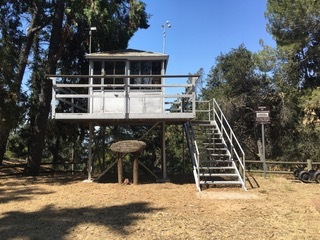 Built in 1925 on Castro Peak, the highest point in the Malibu Hills west of Los Angeles, Castro peak Lookout was an 8X8-foot metal cab on a 22-foot tower. It was built and operated by the Los Angeles County Forestry Department until it went out of service in 1971. In approximately 1978, it was moved to L.A. County Fire Department’s Henninger Flats Forestry Unit, which occupies an island of county property in the Angeles National Forest on the south slope of Mt. Wilson, site of an historic observatory. The tower was refurbished, stocked with 1925 period artifacts, and mounted on a 7-foot tower as a historic public education display, and part of the Forestry Unit’s visitor center/museum.